There was a time that many fighting games besides your standard big name franchises were released to fill certain niches. These games tend to still be released here and there in Japan but often do not make their way overseas, especially in recent years. Thankfully not every developer is afraid of taking a risk and catering to fans who have supported these niches and now we have SNK Heroines: Tag Team Frenzy arriving thanks to SNK and NIS America. Seen as something of a successor to the aged SNK Gals’ Fighters this title looks to bring together some of the most popular female characters across numerous SNK franchises and pit them together in tag-team combat. 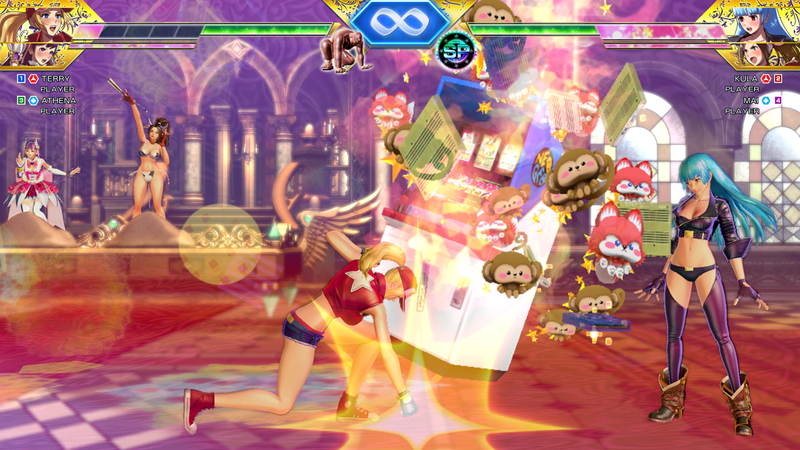 Rather than offering a full campaign SNK Heroines: Tag Team Frenzy offers an arcade mode simply deemed the “Story” mode where players are able to select two of the female characters that they wish to take into the fray. The story sees all of these girls, some pulled from The King of Fighters, The Art of Fighting, Samurai Shodown, and even more obscure series, thanks to Kukri, a mysterious fighter that appeared in The King of Fighters XIV. Kukri has managed to open up his own special pocket dimension and thanks to this, the girls have all been trapped and dressed in strange outfits with the only escape being to beat down Kukri and free themselves before his twisted dream of making the entire world his playground comes true. As mentioned before players will select two characters who will then battle through a number of standard fights, viewing a few Kukri based cutscenes in between, before facing off against the big bad and vanquishing him. This unlocks oft humorous ending sequences for both fighters shown through slideshow sequences while the credits role.These little ending slideshows usually feature appearances from other characters from the main series and Terry’s even seems to focus a bit on the actual storyline from the main series but don’t expect much more than a few laughs from these endings. Another nice touch to this game’s credit is the fact that every pairing of characters has a unique dialogue sequence at the start and end of the mode as well as unique dialogue depending on what character they happen to beat in a fight, giving players some extra motivation to try using different pairings. 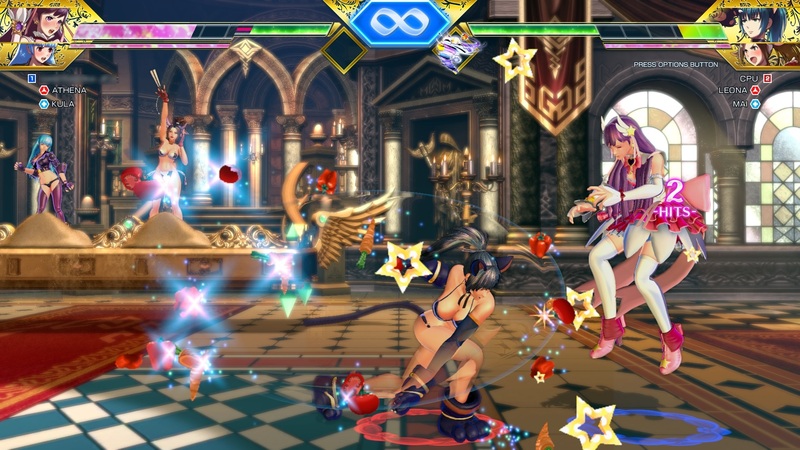 SNK Heroines: Tag Team Frenzy may be a fighting game but don’t expect this game to be one that will test the limits of your button input capabilities. In fact, this title happens to feature a very easy and not even hard to master fighting system. Players are given a weak attack that automatically will string together into an auto combo, a heavy attack, a throw button, and a button that uses special moves. Other than the block ability the title doesn’t really offer too much else in the form of combat other than flashy finishing moves called Dream Finishers that we’ll touch upon in a moment. Despite its superficial nature players can still find plenty of ways to string together powerful attack strings by mixing up their light attacks into specials or, with the use of tagging in your partner and using items, triggering lengthy combos that will devastate your foe but don’t expect too much of this complexity to really come into play unless you want to take your skills and test them against others in multiplayer. Another slightly smaller element comes in the form of items. Around each stage glowing yellow lanterns will appear and when broken they will give the player items that can help them in combat. These range from refilling health or spirit gauges, throwing poison bottles or pinballs at an opponent, to turning the screen into a complete mosaic. Now one element that does separate SNK Heroines from other fighters is the way that it borros a bit from PlayStation All-Stars Battle Royale where opponents can only be finished off with a special move. In this case it happens to be called a “Dream Finisher” and while these moves can be used at almost any time in a fight, they will only completely put down your opponent when they are at low health. Players have their standard health gauge as well as a Spirit Gauge that is required to use special moves and unleash a Dream Finisher but the game happens to balance these in an interesting way. The lower your health gauge gets, the bigger your spirit gauge can grow and vice versa, allowing for a potential comeback if you happen to be doing poorly. Both characters on any given side share the same health pool though swapping out midfight is useful as they do not share Spirit Gauges and can often be brought in to defeat a foe for good. It is worth noting that completely dropping an opponent’s health will leave them in a stunned state that allows for an easy Dream Finisher so don’t expect a one sided battle to easily be turned around despite how tense some final fights can end up being thanks to this system. The actual game modes included in the game can be a little sparse unfortunately and with the short length of each arcade fight, even with the option to see numerous different scenes with different pairings, don’t expect this game to really hold up for long. There is the standard story/arcade mode, a versus mode against a CPU or local player, a survival mode, training, and tutorial. All fights in the game give players money that can either be used to unlock scenes that you haven’t seen before or purchase special costumes for each girl, of which there are three in total, as well as accessories to dress them up in. The online component works well enough here and features the ability to take part in room matches with others or simply fight in quick matches that you can choose to wager in-game money on if you like. It is quite clear what SNK was aiming for with SNK Heroines: Tag Team Frenzy and they have clearly hit the mark when it comes to the character designs. Each girl features a nicely detailed looking character model with each of the three costumes featuring a variety of color options that are often a bit more than a simple palette swap and at least one of these costumes tend to reference the series the character comes from. The fan service element is dialed up quite high in this colorfully flashy fighter and that will delight those looking for a light hearted fighting game to pass some time. In fact, there are even special reward images for beating the game using certain pairings of fighters. As far as the soundtrack goes, the background music is a bit standard for a fighting game, even a less serious one such as this. The voice acting is entirely in Japanese and is handled very well, even in Terry’s genderbent case, and there are even voice options to purchase for each of the girls as well. There is certainly room for light and colorful fighting games in this market and SNK Heroines: Tag Team Frenzy fits that niche perfectly with the bonus of featuring plenty of fan service, especially with characters such as Mai Shiranui and Love Heart being part of the roster. That being said, the actual amount of content found in this tag team fighter is a bit sparse to really keep fans coming back for more and, though being on the Switch like this does make it a perfect type of game to simply throw together a couple of fights without worrying too much about needing to be on the top of your game while possibly on the go. 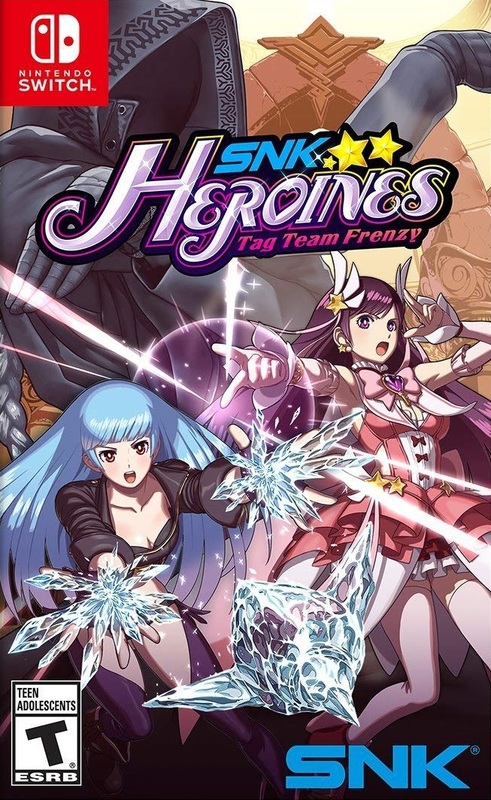 SNK Heroines: Tag Team Frenzy is far from being a complicated fighter and its sparse game modes are limiting but it does deliver a colorful fan service packed package in what ends up being a competent fighting game.